Please login to access your Select Rewards "members only" features. Check your Select Rewards balance to see what you have earned. *Calculations are based on $25,000 wagered at the base level of each service with no points multipliers. Players receive 1 point for every dollar wagered online, on-track at Keeneland, and simulcasting at Red Mile. Your Keeneland Select points will accumulate each day and do not expire. Redeem points at anytime for wagering credit on the Rewards Balance page. *Players can redeem points themselves by request on the Rewards Balance page at any time once 2,500 points are reached. If points are not redeemed, they will be redeemed the 1st of every month automatically if the points balance is 5,000 or greater. 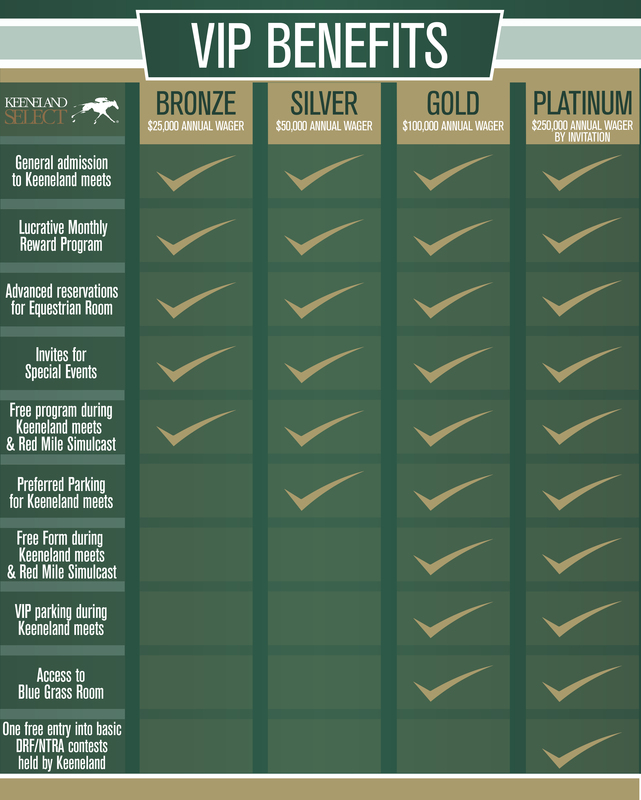 Plus, Keeneland Select customers will receive opportunities for exclusive access to dining and seating for Keeneland’s live meetings, generous discounts at Keeneland’s online gift store, first chance to participate in special contests & promotions, and much more. Customers can use their Select Rewards card at Keeneland to earn wagering points and can even make bets from their online funds. Watch this video to find out how. To read the complete rules on the Select Rewards Program, go here. *Simulcasting located at Red Mile as of July 15, 2015.